Explore “The Wild Atlantic Way” in the Northwest! To really experience Ireland you need to feel it – the land, the rain, the bursting rays of sunlight that change in a heartbeat, but most of all, its ability to permeate the core of your entire being. This is a country that cannot be rushed, and exploring it with a combination of driving, walking, cycling, and climbing is one of the best ways to experience it. This allows you the opportunity to meet the locals, unfold thousands of years of history and understand what makes Irish people so unique. Choosing the Inishowen Peninsula as the starting point in the Northwest, the journey of a lifetime begins. 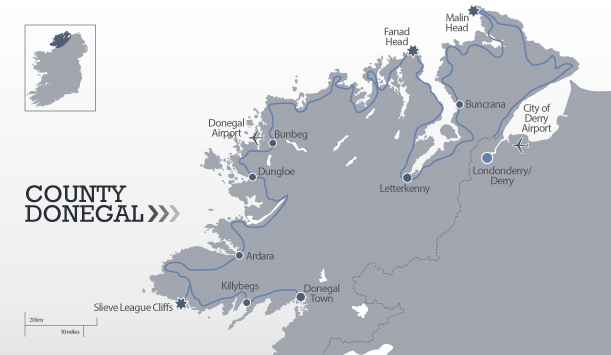 The Wild Atlantic Way is Ireland's first long-distance driving route and one of the longest in the world. Stretching from the Inishowen Peninsula in Donegal to Kinsale in County Cork, the route offers an open road to truly discover the West Coast. It stretches down the Western Seaboard approximately 2500km,and boasts 15 Iconic signature points and spectacular places of interest, with a further 160 discovery points to engrave memories you will never forget. 150 Hidden Gems, where the locals frequent lie off the beaten track can be shared with visitors to get a true Irish experience. Donegal has 3 of these signature points; the first is located at Malin Head, followed by Fanad Head and Slieve League traditionally known as Sliabh Liag in Irish. There is 1100 km of coastline to trace in Donegal. The County’s stark beauty is encapsulated in a journey of a lifetime; lost is the restrictive urban life, immersion in a carefree downtime can rejuvenate your entire being. Once you’ve adopted a “Laissez- faire” attitude, you’ll know you’ve been charmed by this special place, and only dream of the next time you can return. With a driving route that covers miles of panoramic coastline scenery, Enterprise Car Hire have recently announced a special WAW product, to accommodate the independent traveller offering a pick up and drop off service at no extra cost. This option leaves the visitor the chance to do as little or as much of the route as you want, leaving them with more Euros in their pocket to indulge wherever and whenever they choose. In a hinterland previously associated with political and economic turmoil now a story of the past, the county can now encompass the visitor with a positive memorable experience equalling its southern counterparts as a “must see and explore” destination. When the weather is fine, Donegal’s 14 blue flag beach resorts can rival any in Europe, and make perfect destinations for a summer getaway. In the wintertime, the Donegal experience defies the weather, for here there’s no need to set sail to brave the sea – the sea charges ashore and the mists drift on Atlantic winds over fields and into the towns. Storms arrive unannounced, and just as abruptly break into brilliant sunshine, transforming the blue and grey into sparkling greenery. A unique attraction to the Inishowen Peninsula in recent years is the Northern Lights or the Aurora Borealis. The lack of light pollution allows for spectacular images to be appreciated by visitors and photographers alike to chase the dream-like scenes. The arrays of neon colours stream like strobe lights across the Inishowen skyline. The Inishowen Peninsula is bounded to the North and West by the Atlantic coastline. As part of the exciting project launched in March 2014 by Tourism Ireland, “The Wild Atlantic Way “introduces to the avid explorer to a land less travelled, and a voyage of personal discovery at every touch point. The journey hosts signature point 1 at Malin Head and 10 discovery points within the peninsula. Follow the route that starts at Muff; historical enthusiasts can visit the IOSAS Centre, a place of Celtic Christian Heritage, with a cafe and gift shop on site. Redcastle is host to a 4 Star resort with 9 hole golf course and health spa on the shores of Lough Foyle; providing superior accommodation for a relaxing break. Moving along to Moville, a Victorian seaside market town sets the scene for a leisurely coastal walk to Greencastle. This is a great place for a picnic and stopover for families/couples to take in breathtaking scenic views over Lough Foyle. In Shroove, “The Door” to a lovely cave “Port-a-doris” puts the Shroove area in the spotlight, special requests can be made by drinking from the wishing well. Small coves lead to a beautiful sandy beach known as “The Big White Bay” overlooked by Shroove Lighthouse designated as having European Blue Flag Beach status, excellent for bathing, and various water sports. From the Inishowen Head to Culdaff Bay there are numerous historical sites, ancient monuments, birthplaces of famous authors who have written on a variety of aspects relating to life in the local area with historical content. Descending into Kinnego Bay, another world awaits, feeling totally cut off by the sea in front and the sheer cliffs to every side. Winding country roads skirt stark mountains, carpeted with bog and heather, craggy peninsulas, sheep-studded pastures, pristine strands, icy streams, new horizons at every bend. The unspoilt landscape, steeped in rich ancestral culture, surmounted rugged sea cliffs, makes the island’s northernmost point at Malin Head, part of a county that seems eternally braced to hold its own, on its own. The journey to the first signature point at Malin Head reveals vistas to fuel the naked eye with unbridled fantasy and earthly tones that ground the soul. Banba's Crown, is a highlight on the Atlantic Coast tour. This is acknowledged statistically as the sunniest place in Ireland. As sun sets on the day enjoying a pint in Ireland’s most northerly pubs, Farren’s Bar or dining at The Seaview Tavern rounds off a day to remember. Banbas Crown at Malin Head is not just Ireland’s most northerly point, but a concoction of historical, scientific, and ecological importance in the backdrop of landscape that can only be described as second to none in any part of the world. On the other side of the Peninsula there are coves and bays strewn along the coastal route; “Five Fingers Strand” is backed by some of the highest sand dunes in Europe. 17th century plantation village, Malin Town is picturesquely situated at the head of Trawbreaga Bay. Malin also features a stone bridge with ten arches, and is the second largest of its kind in Ireland. Nearby Carndonagh showcases St Patricks Cross dating from the 7th century, and is recognised as one of the earliest crosses outside mainland Europe. Ballilffen Lodge &Spa, The Strand Hotel, are set in a sea resort that has over 2miles of golden sand with superb conditions for windsurfing and surfing. The Carrickabraghy Castle is a short drive from one of Donegal's top cultural sites, Doagh Famine Village, an outdoor museum dedicated to the period between the Famine of the 1840s through the 1900s and the present. The singular challenges of living in this harsh, remote region during a time of such hardship are sobering. Highly recommended are the guided tours, and diverse cultural representation, hence informative and thought provoking. Descending south in the peninsula a trip down the Urris Mountains through Mamore Gap towards Urris on the steep winding road is one of the most breath taking sights in the area. A must is taking in magnificient views to Dunaff Head, with Tory Island visible on a clear day. Traditional Irish villages such as Clonmany, which is host to the famous Clonmany Festival, lead to a walk to Glenevin Waterfall, with nearby beautiful Binion and Tullagh Strands. Here you can stroll along at your leisure, or hire a horse to take in an elevated alternative. Mamore Gap is a walking paradise for the active explorer as this location provides an exciting terrain; Urris Lakes Loop and Butlers Glen Loop walking trails. For those who are keen to visit a majestically perched landmark of significant importance in coastal defence, Fort Dunree played a vital role in military neutrality protection during the War, and the museum displays artefacts with a complete expose of coastal artillery. As the route enters the town of Buncrana, stop off for a chat with local tourist staff, or perhaps stay in the local Inishowen Gateway Hotel, and walk to the local pubs and share your experiences so far. Learn more about the wonderful sights and events that await you on your next stop to a wild bird reserve at Inch Island, or the impressive An Grianan of Aileach in Burt, that when the sun goes down on this original 1700 BC Ringfort, you can see the excellent panorama of Counties Donegal, Derry, Tyrone and Antrim. Don’t forget to come back sometime and visit Inishowen, see us at www.visitinishowen.com for adventure and action packed activity based pursuits, the peninsula has it all. This is just the beginning. Fanad Head follows the next dramatic coastline with a magnificent lighthouse now open to the public with accommodation. Perhaps the jewel of all hidden gems is the last signature point; wide open spaces offering singularly beautiful scenery; the 600m-high Sliabh Liag (aka Slieve League) one of the highest sea cliffs in Europe. Boat trips take people below the lofty cliffs for the imposing view and a chance to spot dolphins, seals and even whales. The adventurous are invited to take a swim in one of the coves. Alternatively, the winding spectacular drive from the top of the cliffs is rewarded with a breathtaking view of the surging sea and the crashing Atlantic waves. With a steady increase in tourism to Ireland in the last few years, and the introduction of Killybegs as a cruise liner port, Donegal can now offer the discerning traveller the “Wild Atlantic Way”. This a county that is unspoilt by overcrowding seeking little havens along a road less travelled. Explore and enjoy, until the next time; because for sure there will be a next time to meet and greet those that made those memories with you.